There is multiple order of magnitude difference between special purpose hardware and software configurable in terms of perf/power generally. The big difference, is that instead of spending huge number of transistors selecting operations, and decoding instructions looking dependencies, you just have small units that just do the work. Byte addition costs~200 transistors 32bit addition ~1000 transistors. and & or are 4 transistors per bit. Shift by constant known before are almost free. For multiplier it approximately takes an adder sized of first operand per bit of second operand. And then you compare those costs the tens of millions of logic transistors in modern microprocessors. Which is programmable method of doing same thing.Tens of millions of active transistors working to execute small sequence of instructions that eventually are just couple of thousands transistors if done in hardware without all the baggage of programmability.With exception of pipelined multiplier & divider execution units are free. What costs is the generic routing networks and instruction decoding and instruction selection and exception handling and TLB handling, and branch prediction and ... Basicly everything that makes it programmable, and to make it easier for programmers to run their programs fast. Now you want to add a second order programmability over those millions of transistors already required to do the work of making first order programmability, by turning their special purpose function to a generic function. >on an OoO x86 processor. The code you put should take 4 cycles on modern x86 processor if the failed condition doesn't happen and branchpredictor would work. Even code like that would get 4 cycles from OoO logic, you could get similar with inorder RISC with proper scheduling but not from inorder x86. And 15 cycles more if branch predictor was wrong. Didn't check if your code worked, just did scheduling for it just like CPU does with its OoO logic or compiler does it with inorder machines. >to implement such a generic mechanism so that it is scalable? The generic mechanism doesn't really work. The OoO scheduling becomes impossible in your scheme. The extra transistors in critical paths, take power and either slowdown the clockspeed or makes your EVERY instruction have multicycle latency. 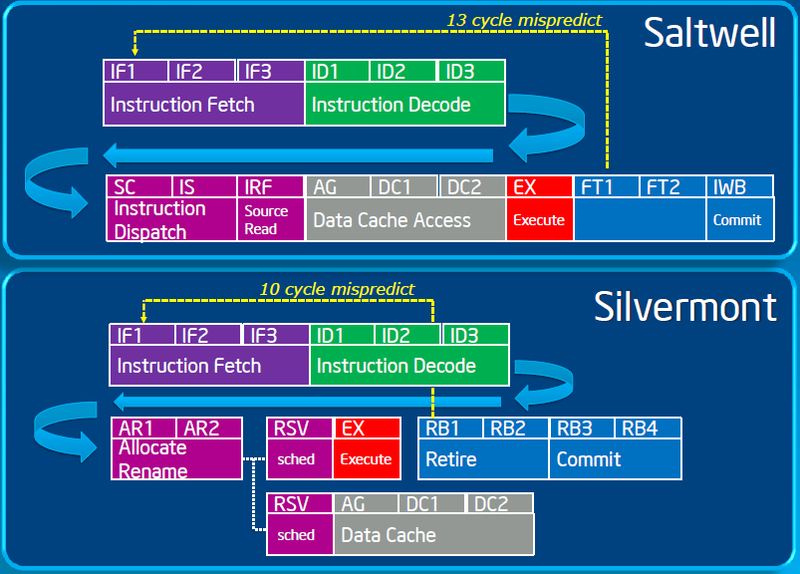 The ancient method of providing ISA programmability to programmers was that they could turn couple of instruction to multiple instructions that would be issued over multiple cycles, but those instructions where normal instructions and nothing fancy. But JMP instruction +instruction cache does the same function but in a more generic way. And you don't need the extra costs in decoding phase with use of those. Jouni Osmala (josmala.delete@this.cc.hut.fi) on September 26, 2009 9:52 pm wrote: > >Now that we established that we do not need a GPU nor a video decoding hardware, > > There is multiple order of magnitude difference between special purpose hardware and > software configurable in terms of perf/power generally. The big difference, is that > instead of spending huge number of transistors selecting operations, and decoding instructions > looking dependencies, you just have small units that just do the work. > > Byte addition costs~200 transistors 32bit addition ~1000 transistors. and & or are 4 transistors per bit. > Shift by constant known before are almost free. > For multiplier it approximately takes an adder sized of first operand per bit of second operand. > > And then you compare those costs the tens of millions of logic transistors in modern microprocessors. Which is programmable method of doing same thing.Tens of millions of active transistors working to execute small sequence of instructions that eventually are just couple of thousands transistors if done in hardware without all the baggage of programmability.With exception of pipelined multiplier & divider execution units are free. > > What costs is the generic routing networks and instruction decoding and instruction selection and exception handling and TLB handling, and branch prediction and ... Basicly everything that makes it programmable, and to make it easier for programmers to run their programs fast. > > Now you want to add a second order programmability over those millions of transistors already required to do the work of making first order programmability, by turning their special purpose function to a generic function. > > >(EAX = 1st number) > >(EBX = 2nd number) > > > >MOV ECX,EAX > >AND ECX,EBX > >SHL EAX,1 > >SHL EBX,1 > > > >TEST ECX,(1<<31) > >JZ failed > > > >ADD EAX,EBX > >JO failed > > > >SHR EAX,1 > >OR EAX,(1<<31) > >JMP done > > > >failed: > >MOV EAX,0 > > > >done: > > > >(EAX = sum-or-zero) > > > > > >If I implemented it correctly, it ideally takes some 8-9 cycles to execute this > >on an OoO x86 processor. > > The code you put should take 4 cycles on modern x86 processor if the failed condition doesn't happen and branchpredictor would work. Even code like that would get 4 cycles from OoO logic, you could get similar with inorder RISC with proper scheduling but not from inorder x86. > And 15 cycles more if branch predictor was wrong. > > Didn't check if your code worked, just did scheduling for it just like CPU does with its OoO logic or compiler does it with inorder machines. > > >But I think your question is of a minor importance. The major question is: How > >to implement such a generic mechanism so that it is scalable? > > The generic mechanism doesn't really work. The OoO scheduling becomes impossible in your scheme. The extra transistors in critical paths, take power and either slowdown the clockspeed or makes your EVERY instruction have multicycle latency. > > The ancient method of providing ISA programmability to programmers was that they could turn couple of instruction to multiple instructions that would be issued over multiple cycles, but those instructions where normal instructions and nothing fancy. But JMP instruction +instruction cache does the same function but in a more generic way. And you don't need the extra costs in decoding phase with use of those.